If you have lots of things to get done in Red Bluff and are in need of a vehicle capable of assisting with that, then you should probably take a look at a pickup. This vehicle type is specifically designed to get work done. Since not all pickups are built the same, you will want to take a look at trucks like the 2019 Ram 1500 that stand out among the rest. There are a number of reasons that Ram 1500 makes for a great truck. This starts with the engine that provides the power. 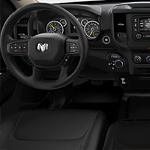 There are 3 available options for the Ram 1500, the strongest of these being the 5.7L Hemi V8 with Etorque. This beast of an engine achieves a best in class tow capacity of 12,750 pounds and best in class 4x4 fuel economy with 17 city mpg and 22 highway mpg. All this while maxing out at 395 horsepower. The 2019 Ram 1500 also comes with an Active Air Dam. This feature automatically extends an air dam downward to reduce the amount of drag and to make the towing process more efficient. This feature kicks in as the vehicle approaches 30 mph.